Madras Institute of Technology (MIT), Chennai was established in 1949 by Shri.C.Rajam. 2019 admssions started.It was the rare genius and daring of its founder that made MIT offer courses like Aeronautical Engineering, Automobile Engineering, Electronics Engineering and Instrument Technology for the first time in our country. Now it also provides technical education in other engineering fields such as Rubber and Plastic Technology & Production Technology. It was merged with Anna University in the year 1978. The broad-based education, coupled with practice-oriented training in their speciality, has enabled the students of MIT to handle with skill and success a wide variety of technical problems. 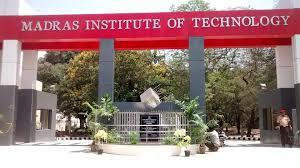 The Madras Institute of Technology has developed into an important centre of Engineering education and earned an excellent reputation both in India and abroad.MIT had received many awards which includes an award for the Best Overall Performance, awarded by Indian Society of Technical Education (ISTE) during the year 1999. The MIT Campus Hostels has been excelling in providing good ambience and perfect accommodation for students who come from different states and social backgrounds. The hostel is positioned inside the campus that helps students in engaging in academics and several extra and co curricular activities without any discomfort or time constraints. Separate accommodation and mess is being provided for boys and girls with a wide range of facilities which ranges from free-WI-FI to Meditation hall. MIT Campus Hostels can accommodate around 2300 students. 1. Separate vegetarian and non-vegetarian kitchens. 3. Three dining halls with a total seating capacity of about 500 students. 4. All dining halls have granite top dining tables, water coolers, pest traps, UV lamps and music playback facilities . 5. Student mess committee decides the menu and monitors the purchases. Mess bill is calculated based on the principle of dividing system . 6. A reverse Osmosis water treatment plant of capacity 500 lt/hr supplies hygienic water to the entire campus. 1. Xerox center with three copier machines. 2. STD/PCO booth with three BSNL lines. 3. Telephone coin boxes located at 5 different places. 5. Hostel Library with about 1000 books and 20 magazines. 6. Indoor and outdoor game facilities. Health Centre is committed to promoting the health and wellness of the campus community by providing high-quality prevention, education, and treatment services. The medical, counseling, and health promotion services are designed to help you stay healthy or get better so that you can minimize disruptions caused by injury and illness. The Health Centre aims to enhance the healthcare experience of the MIT campus community by providing healthcare with respect, consideration and confidentiality. Please review this website or reach out to the Heath Centre staff for details of healthcare resources, prevention methods, health education and general healthcare guidance. The institute has placement coordinators that organize seminars and workshops to map out future possibilities, tap into the hidden job market, build a professional resume, improve interview skills and learn how to negotiate a better salary. Some of the companies where MIT, Anna University students are placed includes ACC Concrete, Thane, ACC Limited, Mumbai, Accenture Services Pvt. Ltd, Amazon, Kansai, Apollo Tyres, Asiana Hotels, TATA Consulting Engineers Limited, Yamaha Motors etc. When filling the application form of TNEA 2019, care must be taken to enter only genuine information. The TNEA application form 2018 will include fields like education details and personal details. Also, when uploading any documents, the candidate must conform to the prescribed format. Madras Institute of Technology shall contribute to the educational, economic and social development.By producing students who are intellectually and technically equipped with well defined knowledge, skills and ethics, who are creative thinkers, inspiring leaders and contributing citizens.By introducing high quality academic and research programmes and providing extension services in cutting edge technologies.